(October 9, 2018) – A week after concluding the inaugural Americas Rallycross (ARX) season at the Circuit of The Americas in Austin, Texas third in the points, Swedish driver Patrik Sandell took part in the Tour de Forest Rally with the rally division of Subaru Rally Team USA. 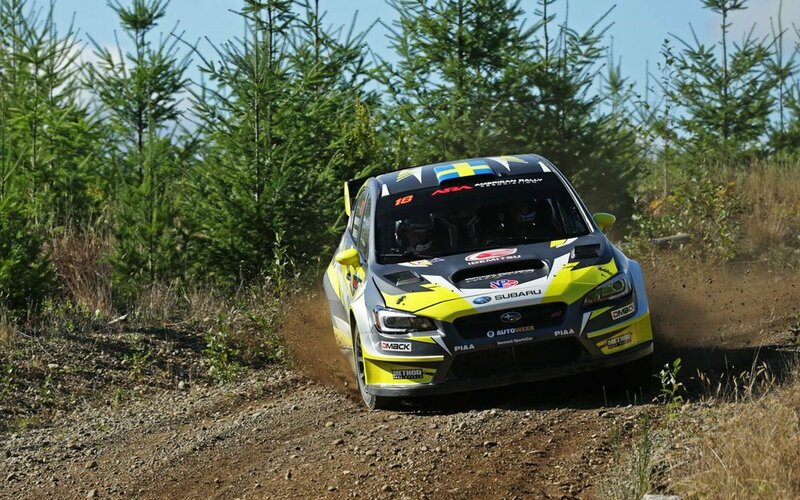 Sandell joined Great Britain’s David Higgins, who raced for the Subaru team in the first ever ARX round at the Speedmachine Festival in the UK this year, to take part in the ARA season finale. On new stages for almost all competitors, the Tour de Forest Rally in Washington provided a 14-stage, 115-mile level playing field, held in wet weather conditions. Higgins and co-driver Craig Drew had already been crowned champions before the event and left the starting blocks fastest on the first day, but it was Sandell who took the lead later in the day as his Subaru team mate ran into mechanical problems. Higgins battled back to make up the time but a strong performance from Sandell and co-driver Per Almkvist meant that by the end of the rally, they had built up a solid lead over second position to claim a third rally win of the season, alongside his third overall position in ARX 2018.